Bessie, Cutter, 6 tons. Mr. Chas. T. Dickins. 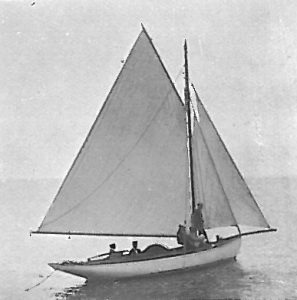 Is owner of the 5-ton cutter-yacht Bessie, and an active supporter of the Sea View handicap class, which was initiated for the encouragement of amateur crews. Mr. Dickins is an all-round sportsman. Residence: Bracken-view, Mill Hill, Barnes.